Be the first to share your favorite memory, photo or story of ALEXANDER JUNIOR. This memorial page is dedicated for family, friends and future generations to celebrate the life of their loved one. 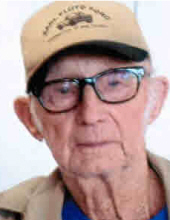 Alexander Junior (June Cotton) Fisher, age 88 of Lockport, died Sunday, February 3, 2019 at his residence. He was born September 1, 1930 in Lockport, and was the son of the late Alex Ferguson and Mary Daphne McAlister Fisher. He was a farmer and a member of Gratz Christian Church. He is survived by his sister: Barbara J. Chadwell of Eminence; and many nieces and nephews. He was preceded in death by two brothers: Delbert F. Fisher and James H. Fisher; and two sisters: Nancy D. Booth and Patsy Boling. Funeral services are scheduled for 11 a.m. Thursday, February 7, 2019, at Sholar Funeral Home of Pleasureville. Rev. Paul Briscoe will officiate. Visitation will be Wednesday, February 6, 2019, from 5 p.m. until 8 p.m., and 10 a.m. until time of services on Thursday. Burial will be in Pleasureville Cemetery. Honorary pallbearer will be Darrell Fisher. Active pallbearers will be Brad Fisher, Mike Fisher, Matt Booth, Robbie Booth, David Booth, and Timothy Dodd. To send flowers or a remembrance gift to the family of ALEXANDER JUNIOR (JUNE COTTON) FISHER, please visit our Tribute Store. "Email Address" would like to share the life celebration of ALEXANDER JUNIOR (JUNE COTTON) FISHER. Click on the "link" to go to share a favorite memory or leave a condolence message for the family.